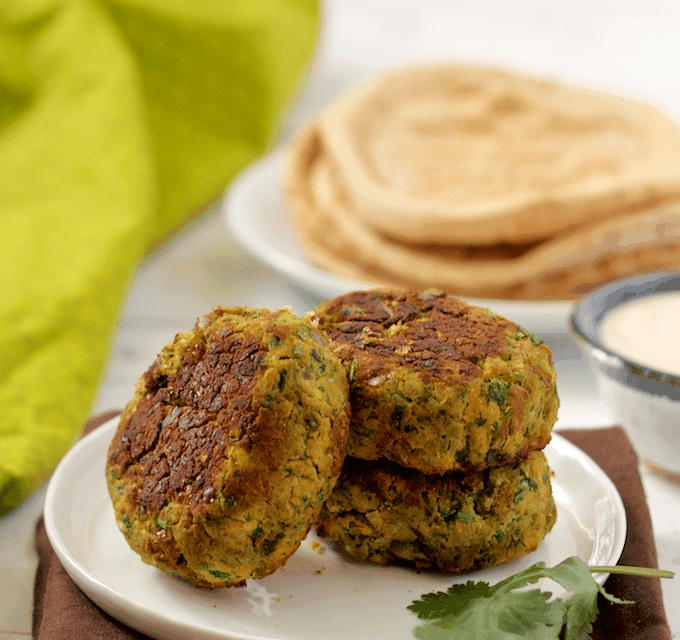 These easy baked falafel patties are sturdy with bright, fresh herbs running through them. 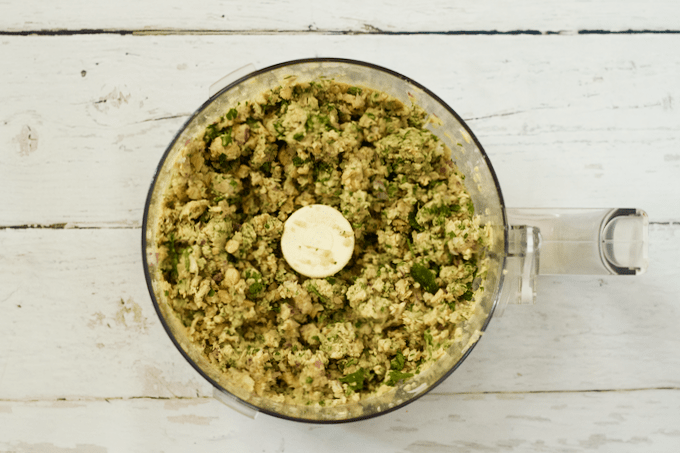 Perfect for stuffing into pitas and drizzling with this simple, creamy tahini sauce! My favorite restaurant in college was a hole-in-the-wall Mediterranean joint and I loved their falafel appetizer. I also loved their crazy music, their interesting paintings and their ability to give me massive amounts of food for so very little money. College dining on the cheap, right? You should probably be careful not to burn your fingers as you reach for one on the pan straight out of the oven. Cannot resist. Is that just me? These falafel are bursting with bright flavors from the fresh cilantro and parsley, and they pack a hefty, hearty flavor from all the meaty chick peas. They have a crispy crust on the outside and a soft, creamy inside. You are going to want to eat falafel forever! Breakfast, lunch, dinner, I’ll eat these any time of day. Doesn’t get any better than those amazing flavors all smushed up together, if you ask me. They are perfect stuffed into a pita with lettuce and tomato and drizzled with the easy tahini sauce I’ve included in the recipe below. They also are great topped with hummus (alone or in pita or a wrap). I also like them served over salads or grain bowls for a plant-based protein. ALL the delicious flavors in one place. This is the stuff dreams are made of. Make small, thick patties. This makes them easier to flip. And then you get a big bite to sink your teeth into. Spray the baking pan with cooking spray so the patties don’t stick to the pan when you try to flip them. Flip carefully. If a couple start to crumble on you, just smush them back together. They will firm up in the second round of baking. Mediterranean food calls to me. It’s in my bones somehow and there’s no denying its temptation. So I submit. Happily. I hope you will too. Enjoy! 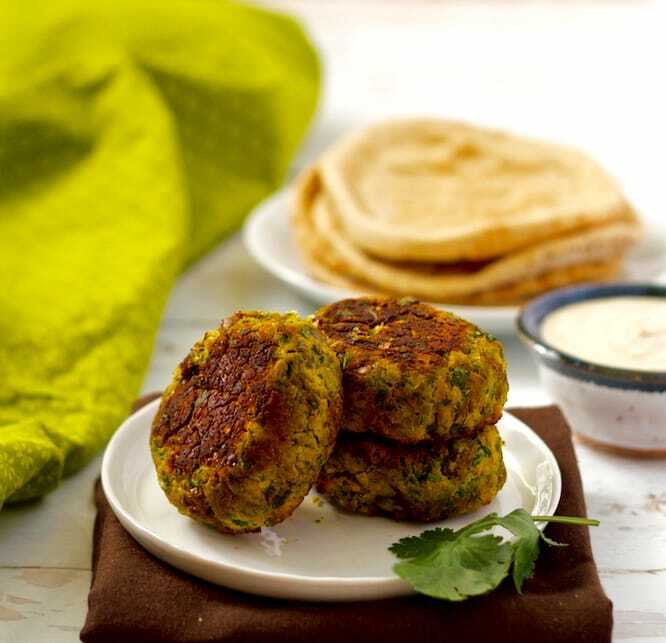 These easy baked falafel patties are sturdy and have bright, fresh herbs running through them. Goes great with the creamy tahini sauce! 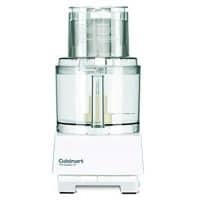 Combine the chickpeas, red onion, garlic, cilantro and parsley in a food processor. Process until broken down but still a little chunky. Transfer the mixture to a bowl and add the remaining ingredients (through baking soda). Mix well. Form the falafel mixture into patties. I like doing small, thick patties - it makes it easier to flip them and they hold together better. Plus, you get a generous bite! Place the patties on a plate, then cover and refrigerate for at least 1 hour. Or, you can stick the patties in the freezer for 20-30 minutes. Preheat the oven to 400. Remove falafel patties and space them out evenly on a baking pan sprayed with cooking spray. Bake at 400 for 20 minutes, then flip carefully. If any of the patties fall apart a little, you can carefully use the spatula and your hand to smush them back together. They firm up by the time they are finished baking. Bake another 10-15 minutes, until well browned and firm. Once they are finished cooking and nicely browned, remove the falafel patties and let cool for a couple minutes on the pan. 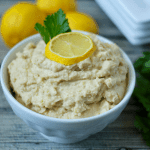 Serve in the pitas with the tahini sauce, and enjoy! 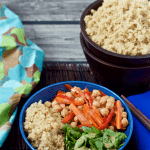 Tahini is a sesame seed paste with a great nutty flavor. I usually find it near the peanut butter in the grocery store. 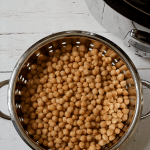 You can use canned chickpeas or make your own crock pot chickpeas from dried beans. These are also great in pitas with hummus. Or just topped with hummus and eaten alone. And I love the extras, which get crumbly, sprinkled onto salads. Sometimes I even add leftovers to scrambled eggs in the morning with some salsa. So good any time of day! looks so delicious! Baked falafel is a total winner! Hi Jay! I just updated my recipe card to indicate that it’s 2 patties to make sure it was calculating correctly. It now says that it’s 134 calories for those 2 patties, plus the tahini sauce. Hope that helps! Mediterranean food is one of my favorites!! 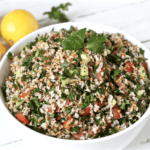 When I was pregnant with my son I ate falafel at a local restaurant at least one a week! Yikes! 🙂 I love eating them with tzatziki! 🙂 These look awesome!!! Thanks Laura! Once a week falafel sounds like a great idea, pregnant or not 😉 And yes, also so good with tzatziki! I love baked alternatives to usually fried snacks. Like you I try to avoid the fryer but falafel is one of my go-to bites for my lunch box – thank you for sharing a true healthy alternative! These falafel patties look absolutely delicious! I wanna grab some and dip it in that sauce! Thanks Marsha! Dip, dunk, devour! I have been thinking of making falafel. I love that you baked it and still got such a good crisp on it. Do it Peter! Everyone needs falafel in their life. 🙂 And yes- I finally got a good crust. Just follow the tips above and you’ll be all set! I’m all about reforming fried foods! These look great and I love the easy tahini sauce. Thanks Sonal! Same great flavor but not fried – woo hoo! Love that we had the same go-to college food cravings 🙂 And that now we do it healthier and at home! I’m with you – make it all for you because you will not want to share! Thanks for stopping by and have a great weekend! Ah, my weakness! Falafel and of course TAHINI!!! I could so eat this every day and be totally content! Me too Rebecca! Falafel forever! 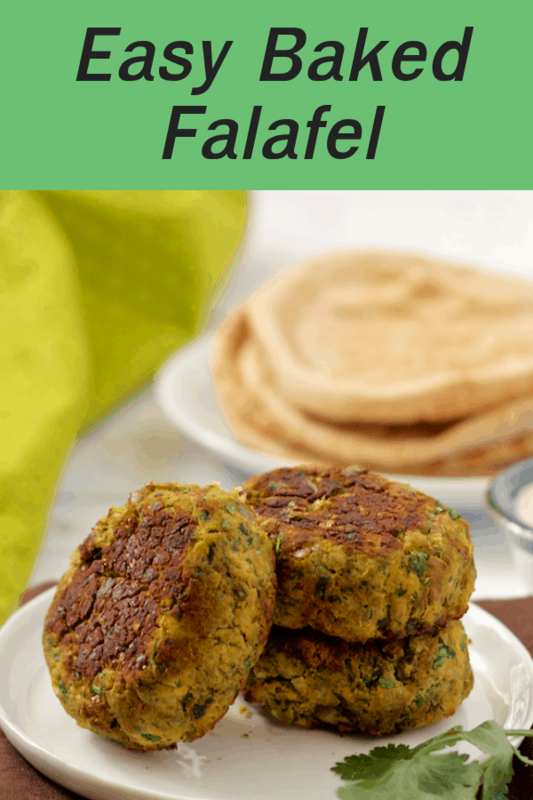 Falafel is the best and this is a super easy recipe – just mix, form into patties and you’re ready to go! I hope you give it a try and let me know what you guys think! I could definitely eat falafel forever! I loved your baked version, and they *do* look sturdy! Yum! Oh how I love falafel, and these remind me that I haven’t had any in ages! I love that you’ve baked them instead of fried them, Kathryn – I do love the taste of the fried ones, but I can’t bear standing over a pan full of hot oil. Usually by the end of it I’m just too hot and sticky to have a decent appetite. And you remind me that I miss all my college (well, here we call it uni!) eating spots, too. My favourite were burritos! So greasy but SO darn good!! You’ve got to try making it Lisa – you’ll love how easy it is! And no oil splatters or burns with this baked version 🙂 We had a burrito place in college, too – can’t beat a huge burrito for a college appetite! I love falafel!! And baked? This sounds so perfect! You know, I just love falafel (and being surrounded by food trucks here in lower Manhattan I have easy access) but I’ve never tried making it myself – you have inspired me with this great step by step post. I can do it! Easy access to food trucks sounds so fun! But you can definitely do your own falafel Kate – it really is easy! Plus then you get to control the ingredients 🙂 Hope you give it a try! Absolutely it’s just for you Cheyanne! Had a feeling you were overdue for some 🙂 Glad, too, you don’t think I’m crazy for eating them for breakfast! P.S. The oven is being installed as I type this – woo hoo! Thanks Rahul! 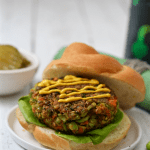 I’m a huge falafel fan, too, and this baked version really holds up! These baked falafels look just perfect! And yum to that creamy tahini sauce! Mmm, I love falafel! I’ve never even attempted to make it from scratch, though — for some reason I just have this mental block where I think I’m going to fail miserably, so I don’t even try (so unlike me 😉 ) I think this is just what I needed to encourage me… they sound so good! How fun that you had a great Mediterranean place to eat when you were in college, mmmm. We had a chicken wing place and a sub place. Okay, it was an epic sub place and in Rochester, NY all of the chicken wings are good…. 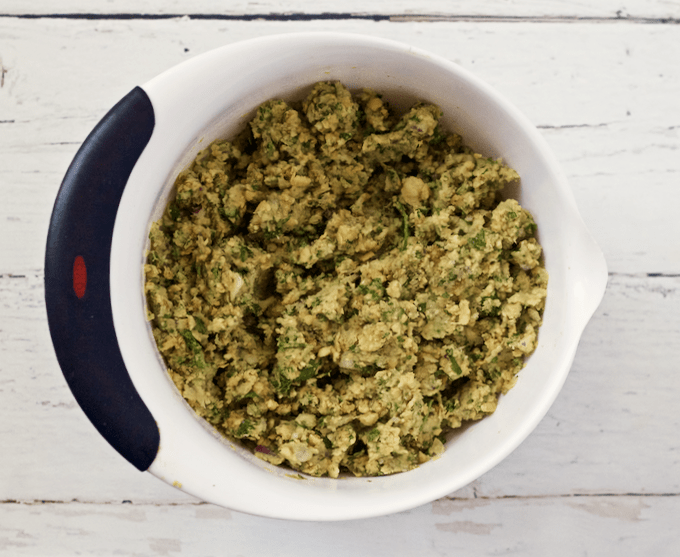 I LOVE this recipe and have been hungering for some good falafel. My first low-carb attempt was an epic FAIL! I’ll have to try these because they look majorly delicious! I have had a few falafel fails myself but this recipe has worked like a charm. Would love to hear if you try it and what you think! Thanks Marla! Baked is the way to go! I love homemade falafels, and these look amazing!! Thanks Sarah! Hope you give them a try! Looks just delicious – can’t wait to try these!! Stopped by to do some sharing from #FoodieFriDIY! I have always wanted to make falafel, but I don’t fry things. I will have to give these a try! Thanks so much for bringing them by Throwback Thursday. These look so marvelous and I love that they’re baked and there’s not all the hassle of frying! Not to mention the obvious healthier aspect! Great recipe, Kathryn! What’s the best way to reheat these after you make them? They’re in the oven now, but I already know I’m not going to be able to finish them all! Hi Aly! I hope you loved the falafel! I store them in the fridge for a few days and reheat in the microwave, because I’m kinda lazy and inpatient. 😉 They tend to crumble a bit that way though so you could warm them back up in the oven or a toaster oven if you want them to stay intact. They also freeze great, too! Again, they may get somewhat crumbly but you can use them that way to stuff pitas or top salads. Hope that helps! It was delicious! They did get very crumbly, but I just made a falafel-hummus soup and everything worked out! i have no idea why i had such a different end result than everybody else, but i’m really disappointed. Hi Daniela, I’m so sorry to hear that! I’m not sure if they were falling apart before or after you baked them. If before, you may just need to refrigerate for longer – that really helps! If after, it may have been that they needed to bake longer before flipping, after flipping, or both. Regardless, sorry it didn’t work for you! Mine were way too salty. 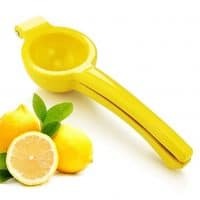 I would consider cutting the salt in half if you aren’t a huge salt lover like me. Thanks for noting that Sara! I usually use homemade chickpeas, which have way less salt than the canned variety. And depending on the brand and how well they are drained and rinsed, that could affect the salt content too. But a good point that people could reduce the amount of salt and maybe just sprinkle with some sea salt after baking if they want more. I made them and its to salty and I think there is to much soda. Yuk. I ruined the recipe. You have to cut half of soda and salt please. I’m sorry to hear these didn’t work out for you! I haven’t had an issue with the baking soda or the salt level, but that can certainly be affected by your chickpeas. If they aren’t rinsed really well, they can retain a lot of the liquid from the can, which is high in sodium. But you can certainly try adjusting those two elements if you want to make them again. Thanks so much for sharing your recipe. I’m really pleased to learn how to make falafel. I got as far as “spray your pan with cooking spray” though. I’ve managed to live this long without ever buying “cooking spray”. I just can’t justify the land fill or expense. A little bit of olive oil, already on hand, will do the same thing. Kathryn, I made these last night and they were awesome! The kids even gobbled them up. 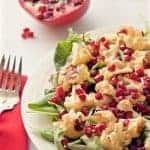 I have to try this recipe ASAP! Definitely going to try these the next time we do a Greek night. Yay, I hope you do Megan! I love baking falafels! Healthy and delicious! These look delish! These are delicious! 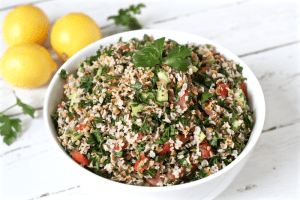 I add a bit more cilantro and parsley, (which just helps make them more fantastically tasty) – I also serve them with a yummy, garlicky tzatziki sauce and homemade turnip pickles. I’m so happy to hear you loved them Trish! Love those pairings too – yum! I made these today and they turned out crispy but were relatively inedible with the amount of salt. If using canned chickpeas, definitely omit the salt completely or lower the amount at the very least. Hi Joce, I wonder if your canned chickpeas were extra salty for some reason. I have definitely used canned before for this recipe and the falafel were fine. The trick is rinsing the chickpeas really, really well to get all of the canning liquid off of them (that’s where most of the sodium is). Sorry it didn’t work this time but I hope you try them again! It’s only me in my household. I’d rather have these falafel made fresh. 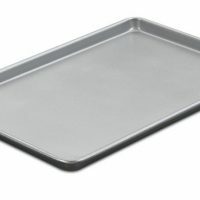 Would I be able to either refrigerate or freeze the extras before baking to make later? Hi Kristen, I’ve never tried that since we tend to use them up, but I think it would work. You would probably want to freeze them on a wax paper-lined baking tray until they firm up and then transfer them to a freezer bag until you are ready to use them. Hope that helps and would love to hear if you try it! The recipe had some nice flavor but, honestly, it needs a rework. Despite following all of the directions, tt was terribly crumbly and did not hold shape during the cooking process and fell apart into crumbles on our plates. It needs some sort of binding ingredients. I often use another ‘baked’ recipe that includes a bit of flour and an egg. In addition, as others have mentioned, it was way too salty, despite the fact that I only used 2/3 of your suggested amount. Beans were rinsed thoroughly, in case you’re wondering. Hi Linda, I’m so sorry you had trouble with this recipe. My patties always stay together great after they’ve chilled in the fridge, but there are so many variables that could have affected yours. You could definitely try adding an egg as a binder next time to see if that helps. Also, I’ve never found these too salty myself but I am going to revise that in the recipe card since you can always add salt but you can’t take it away. Thanks for the feedback! Could I freeze these after baking them? If so, how would I reheat them afterwards? Hi April, yes, you can freeze the extras after you’ve baked them. I let them defrost in the refrigerator overnight and then reheat them in the microwave or toaster oven. They tend to be more crumbly the second time around, but work great for stuffing into pitas or putting over a salad. I hope that helps! I really must learn to read comments under a recipe before deciding if I’m going to try it. I encountered the same problems as others: Fortunately instinct told me to skip the salt. My mix was so crumbly that I couldn’t form it into anything resembling a patty. So I added two eggs and when that didn’t bind it enough I poured the whole lot into a baking tray and cut it into cubes after it was cooked. What I got wasn’t really falafal, but it was still edible and yummy in a wrap with salad. Hi there, I’ve actually revised the amount of salt in this recipe because of some of the comments from others, so hopefully that won’t be an issue going forward. I’m sorry you had trouble with getting them to stick together. Did you refrigerate them according to the directions? That makes a big difference. (I have other tips in the post about how to get the patties to stay together and be sturdy, like mine are in the photos and video.) Regardless, I’m glad the flavor was good and you were able to enjoy them! Made these last night and love the recipe. Very easy! However, still too salty. I will definitely be making again but with half the salt amount. Note: I used canned chickpeas with no added salt, and I rinsed them very well before use. OMG, just made the and they are soooo good!! Added chopped jalapeño for some spice, otherwise followed your instructions, this was my first time making falafels, and won’t be my last! I was just going to sample a tiny bit before putting them in the fridge but inhaled the entire thing. Oh yeah, wanted to add we do the Slow Carb Diet, and this fits pretty well into that. Can I make the patties a day or two in advance and leave them in the fridge until ready to bake? Yes, that should work just fine! Hope you enjoy them! I am trying this recipe for the first time. However, where in the falafel patties is the baking soda called for in the ingredients list? Hi Dawn! That’s step 2 – “Transfer the mixture to a bowl and add the remaining ingredients (through baking soda). Mix well.” Hope that helps and hope you enjoy them! I missed that part! The ones I made were very good, but very dry-I’m assuming because I simply left out the baking soda.